Hello, lovelies! This post is another about nails, hopefully you aren't getting sick of seeing my nails so often! Today I'm reviewing Blue Screen of Death (BSoD) from Pomegranate Nail Lacquer. If you aren't familiar with Pomegranate Nail Lacquer, their polishes are "4-free". They contain no toluene, formaldehyde, DBP, or camphor. They are also cruelty-free! Now, I've personally had my fair share of blue screens when it comes to computers and there's nothing pleasant about it, however this nail polish has made me fall in love with the words! My first thought when I had pulled this out was how small and cute it looked! I absolutely love the packaging and the logo on it. However, I noticed that it actually has a tad bit more than the average polish. This is two coats of BSoD without a top coat. 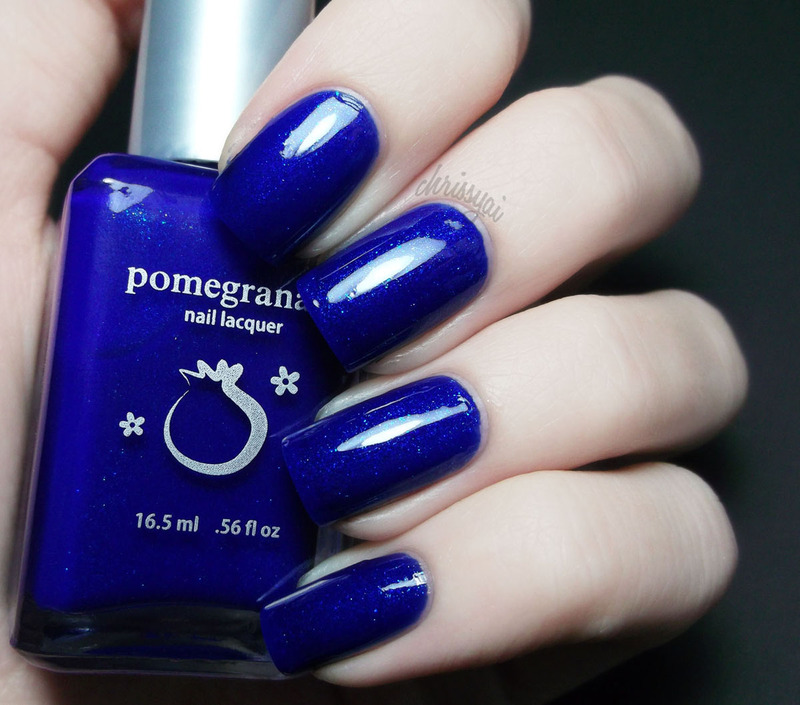 This polish is a gorgeous bright deep blue jelly with turquoise shimmer. I have to say this is the most opaque jelly polish I've tried so far. I could hardly see any VNL in person, though it did show up more clearly on camera. The formula is really nice, it's not thick or gooey like some can be and applied smoothly. It was a little streaky in the first coat but evened out so nicely with the second. Despite no top coat, BSoD has an awesome shine to it. Unfortunately, this polish didn't photograph as gorgeous as it actually is! If you're interested, you can find Blue Screen of Death here for $9.00 USD. Pomegranate Nail Lacquer also offers automatic free shipping when you reach $27! Thank you! Haha, it's very eye catching! I LOVE this one. It looks fantastic and ZERO flaws. I'm impressed! My right hand would look a hot mess if I took photos of it. Thank you! I agree, it's soo gorgeous! This is a really gorgeous polish! I love how it has the subtle shimmer...so lovely! gahh! i hate getting blue screens! and beeps.. agh. haha anyway this polish looks amazing though - it's very cute too! I know, they're the worst! This is the best swatch I've seen of this polish, and now I want it! Aww, that's so sweet, thank you! I recommend getting it, it's absolutely lovely! I love your nail posts :-). This is a beautiful blue! Lovely blog. Thanks for your comment and following. Definitely following back. Hope you will visit me again and again. Oh you know I love nail posts so please feel free to spam us with more! Umm...I LOVE THIS BLUE!!!! What the poo, it's so gorgeous! Is there free shipping for Canadians too? Blue Screen of death like the Blue Screen Error on Microsoft computers? Is that what that means. I had that once on a old laptop, it really sucked and this blue looks JUST like it. It's so blue, and very pretty!